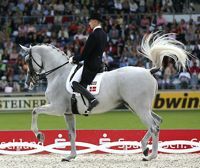 Neither the cause or cure of equine back problems is well understood, considering that a massive industry has literally built itself up on horses' backs. The reason for this is the usual one: we can get away with it most of the time. Unfortunately horses will, and do, work for us despite discomfort and pain. Not all horses, of course, either because they are less tolerant or their pain is less tolerable, and those horses tend to make a sad journey downhill to the end of the line (see Rescue Horses). How can we know that there is such a wide-spread problem then? Well it becomes clear when we see the way horses move and behave when they are relatively problem free. 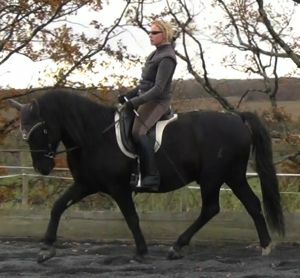 It is the sad truth that the vast majority of ridden horses are terribly stiff or in pain. Sometimes the problems originate in the spine and sometimes in the feet or elsewhere, but a problem at one end tends to balance itself at the other. The horses movement feels flat and easy to sit to. The horse's movement feels jerky and definitely not easy to sit to. The horse does not appear to swing when he walks. 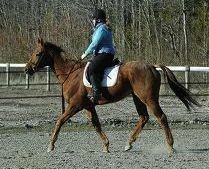 The horse has difficulty walking in a clear four beat stride. 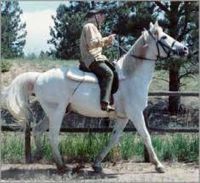 The horse has difficulty stretching out and down when ridden. The horse is insensitive to the leg and difficult to move sideways. 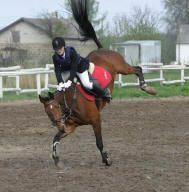 The horse reacts aggressively to the saddle. The horse is difficult to mount or drops his back when mounted. The horse bites round at your feet when you ride. The horse bucks at any time when ridden or jumping. The horse's back is not a beautiful smooth line from wither to tail. Some of these signs may be caused by different physical problems, but none of them are normal for a healthy, well-trained horse, and they make up only a tiny fraction of the full list of symptoms caused by equine back problems. Why Are There Such A Lot Of Equine Back Problems? The answer is simple. Horses did not evolve to be ridden by people, and unless we go to a lot of trouble to prevent these problems they will arise as a matter of course. Most 'equine back problems' are actually intelligent efforts made by the horse's system to protect their spinal column from forces they have no other protection from. We assume that because humans have been riding horses for a fairly long time, and the evidence of wide-scale equine back problems is not particularly obvious, then it doesn't exist. It is true that if horses seem to manage so well anyway then why do we need to go to such trouble? We personally believe that it is our responsibility as intelligent beings to become more and more aware of what we do and what the consequences are. As soon as we start to question ourselves a little bit, we start to realize that there is always room for improvement, and we will also feel better as a result. For example, how many of us really enjoy riding which requires force to make the horse comply because he doesn't seem to want to? Who actually enjoys having to jab away with spurs to make a horse move, or having to haul a horse in the mouth to make him turn a corner to a jump? Or holding a horse's head down for the duration of a dressage test in case he throws it up to try to get away? We did all those things in the past, and decided - guess what - 'I really don't want to do this anymore, it just doesn't feel good, there has to be another way'. 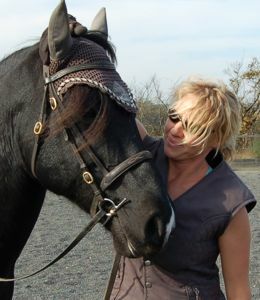 In fact, if there was not another way, and we found that our horses wouldn't listen when we respected their boundaries, or they stayed insensitive to riding without spurs, or we couldn't make them soften their jaws without a double bridle, I know we would have decided that horses are better off without us sitting on their backs. What we did find was that when we respect their boundaries, they start to respect ours. 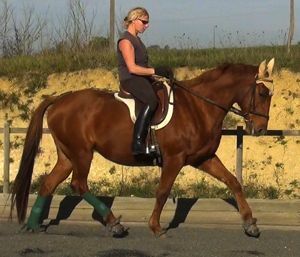 When we ride without spurs their sides become more and more accepting and sensitive and when we engage them because we get our postures right as often as we can, they soften and carry their own necks beautifully! We also found that if they don't do these things as a result of gentleness then they have a physical problem. Equine back problems account for the vast majority of stubborn, lazy, ignorant horses and chestnut mares! How Can Equine Back Problems Be Prevented? Just as most of our society's problems could be resolved in the classroom by educating kids intelligently, we could make a huge difference before we even get on our horses. 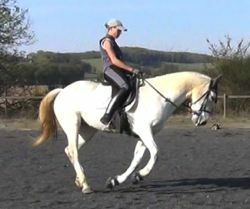 It is crucial to prepare young horses properly to be able to cope with the weight, and unbalancing effect, of a rider. It also brings to light any problems which are already there before they are aggravated further by a rider. 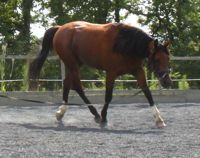 Lunging young horses towards engagement strengthens the required musculature and crystallizes the infrastructure of the nerves. Hollowing responses are never then associated with a riders weight or aids at the beginning. 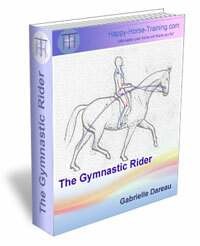 When the horse is ready to ride it is important to then ride sympathetically and correctly. This means balancing the horse by using seat aids which make bio-mechanical sense i.e. they work with all horses because they are in alignment with the structure and function of the way a horse moves. In this way the reins will stay in their correct and safe role as a means of sensing the completion of the engagement ring. 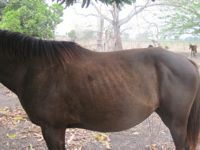 Rider's weight too much for horse's back (unprepared/untrained or incorrectly trained horses). Sitting with a fork seat where seat-bones oppose the stretching of the top-line muscles in horse's back. 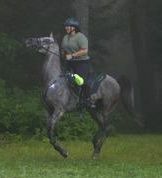 Holding horse's front end, especially with a double bridle, to incorrectly collect or control. Badly fitting saddles which rock, 'clothes-peg' or bridge on the horse's back. The rest of most of the equine back problems which arise tend to be caused by injuries (particularly when the horse's own weight comes back on himself e.g being caught in a fence), birth trauma and lack of, or unbalanced, nutrients, particularly during development. This horse actually fractured his spine as a youngster but therapy and correct training over many years has allowed him to round his back and engage correctly. Can Equine Back Problems Be Healed Once They Exist? 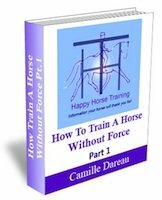 Healing these kinds of problems in all kinds of horses has been our preoccupation for twenty years now, and the answer is not a simple one. If you want to know the answer you have to ask yourself first what you really care about. If you care about your horse and your unique relationship with that horse then you will make a wonderful journey, and the end result will not matter so much in itself. Of course equine back problems and any other physical or emotional problems can heal. Healing itself is like water flowing downhill. The difficult bit is finding whatever is blocking its path. Finding out whether that is in you, in your horse, or a bit of both, is the fun bit. 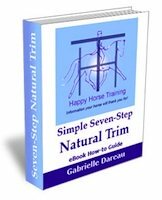 If you care about achieving competition results or any kind of riding results on any horse, then that is a different matter, and the 'healing journey' is probably not for you. Whatever our limits are in life, they will be presented to us in many different ways until we are prepared to address them. If we don't choose to address them because we're not ready, then that's fine too. For us 'healing' means when a horse finds self-confidence and beauty within. It means when we can trust each other and enjoy each other's company. It means when physical injuries and restrictions are understood and released. 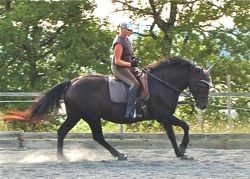 Sometimes this means we move closer to the conventional expectations in dressage and sometimes not. It always means moving towards greater beauty, because beauty is the free flow of energy.